Glad you found Bishop Creek Community Church! Scroll down so you can get acquainted with the leadership. We hope you join us this Sunday to worship our glorious God! Kelly Larson is our Pastor. We are thankful here at Bishop Creek Community Church to have Kelly Larson serving as our Pastor. We met him for the first time in January of 2008. He and his wife, Suzanne, moved to Bishop from Fullerton, California in July of 2008. Pastor Kelly is dedicated to the teaching and preaching of God’s Word. Kelly and Suzanne, know that God called them here to Bishop, and they love ministering to the church and the community together! They have been married since 1999. Kelly enjoys reading, golf, and ukuleles. Pastor Kelly is an ordained minister with the Evangelical Free Church. He completed his PhD in Systematic Theology at South African Theological Seminary in 2015. He graduated from Biola University with a master’s degree in Christian Apologetics in 2008, and received his BA in Marketing from California State University Fullerton in 1981. Phil Graham is an Elder at BCCC. He moved to Bishop in 1974, graduating from Bishop High in 1978. 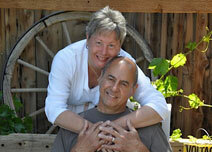 He met his wife Lorri in 1981 and they married in 1986 while attending college in Chico. After gathering their degrees in 1987, they moved to Sacramento, where daughters Michelle and Lisa were born. In 1993 they decided to return to Bishop to raise their girls and enjoy small town life. Lorri home schooled their daughters through high school. Both Phil and Lorri accepted Jesus Christ as Lord and Savior in 1997. Phil and Lorri started attending Bishop Creek Community Church in the summer of 2014, attracted by a sermon series on the Holy Spirit. They stayed because of the solid preaching of the whole Bible and the sincerity of worship and fellowship. They enjoy the many opportunities throughout the week to apply what has been learned and to encourage and exhort one another as well as serving the body of Christ. Ed Duran has been an Elder at BCCC. Ed was the oldest of seven children. At the age of 19, he was drafted and became a Field Medic in the Army serving in Vietnam. Ed and Nancy were high school sweethearts, and married in 1970. Ed graduated from CSULB with a degree in Industrial Technology. They moved to Bishop in 1975, both coming to faith in Jesus Christ in 1976. Ed and Nancy have owned two businesses and raised two children, Joel and Sarah. Ed has served in a variety of Church positions and has taught adult classes most of his Christian life. Early into his Christian walk Ed had a desire for searching the scriptures for answers. That passion has continued in his entire walk with the Lord. The study of End Times has always been his favorite personal area of study. Suzanne Larson is our Women’s Ministry Director and Communication Director. She is the wife of Pastor Kelly. Suzanne grew up in Glendora, California. Her first memory is praying with her mom to receive Jesus. She attended Azusa Pacific University, where she received her B.A. in Communication and a minor in Bible in 1988. She went back to APU to get her teaching credential from APU in 1991, and received a master’s degree in Education: Curriculum and Instruction from APU in 1998. She is licensed by the Board of Ministerial Standing of the Evangelical Free Church of America. She taught elementary school in public and private schools for 18 years (7 of those teaching Computers) in the LA/Orange County area before they moved to Bishop in 2008. Suzanne loves ministry, loves people, and really enjoys animals and computers. She loves ministering to the people of Bishop with her husband.